Manuf. 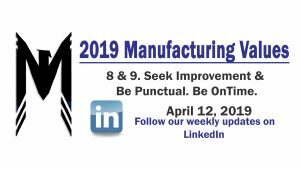 Values 8 & 9 - Seek Improvement, Be On-Time - 2019 - Mohawk Electrical Systems, Inc.
Repost January 2017 – click here for more archives. At Mohawk, we are always seeking improvement on standard processes to benefit both our employees and customers. When problems arise in the workplace or when following procedures, management always aims to find easier ways to accomplish production goals while maintaining our quality standards. It is highly encouraged that production employees give their feedback to current processes to continue to improve and help create a harmonious working environment. Applying creativity and enthusiasm towards the development of solutions is encouraged by everyone on staff at Mohawk and is also encouraged by our customers. We manufacture specifically designed parts for our customers so their creativity and feedback is ultimately valued when we are elbow deep in their projects. Whether it comes from a production employee or the customer themselves, the information is shared to see if the process will work for both Mohawk and the customer and achieve production goals to above customers expectations. No. 9 – Be Punctual. Be On-Time. Be on station. As a small company, Mohawk depends on everyone being available and focused to produce customers projects efficiently.Being a small business, every employee is highly depended on to do their part on the production floor. Being on-time and on station allows production to meet its daily and weekly goals.